Us Brewers love to keep up on current affairs. So when we saw the O.J verdict, we couldn’t believe it! This beer is for that poor guy, and all he’s been through….. UPDATED: MAR 27, 2019 Cloudy orange colour. Moderately-sized head. Aroma is lots of fresh tropical fruit. Taste is really juicy. Texture is somewhat oily. Bitter finish. UPDATED: MAR 2, 2019 Can. Orange golden pour. Aroma of pineapple, orange zest, citrus, bready malt, oat and mango. Taste has juicy pineapple, mildly tart orange zest, oat, bready malt, citrus and mango. Good one. Flight at Crafts. Pours unclear yellow. Aroma is strong tropical fruit, pineapple, mango, passion fruit. Body is medium, but full and juice and oily and mineralic. Lowish carbonation, but it doesn't need more. Straight NEIPA, and good at it. UPDATED: NOV 18, 2018 From backlog. Can from Systembolaget Gårda, Gøteborg. Cloudy orange with white head. Malts, hops, Juicy, Fruity. Nice! UPDATED: NOV 18, 2018 Sampled draft @ The Crafts in Kloten, Switzerland. Hazy orange, creamy white. Nose is nicely juicy, citrus fruit. 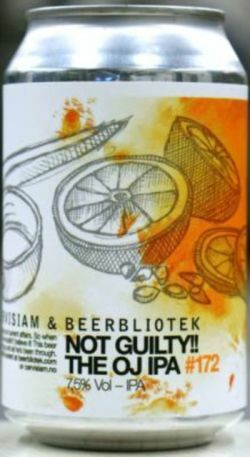 Taste is bit chalky, weird, bitter weeds, citrus peel, bit strange but okay. Appearance: Hazy golden colour with a white head. Aroma: Hops, citrus, pins, grapefruit, fruit. Flavour: Hops, fruit, malt, caramel, citrus. Hazy golden amber color, white head. Grapefruit nose, ripe pineapple, peach, melon. Grapefruit taste, resin, grass, sweet fruity, orange, light malty, peach, moderate bitterness. Medium body, soft carbonation.